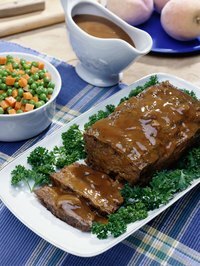 Meatloaf cooking times and temperatures depend on the specific instructions of the recipe. The general rule of thumb is to cook an average size meatloaf -- between 1 and 1 ½ lbs. -- at 375 degrees F for between 50 and 70 minutes and a large 2-lb meatloaf at 375 F for between 75 and 90 minutes. However, you may need to adjust these times and temperatures if you use a pan size different than that for which the recipe calls. Calculate the surface area of the pan that you want to use. Measure the length and width of the pan on the inside, since thickness of the pan may affect measurements, and multiply these measurements to calculate the surface area. For a round pan, measure the diameter, then half this figure and multiply it by 3.14. Compare the surface area measurement to the surface area of the pan recommended in meatloaf recipe instructions. If the measurement is the same, do not adjust baking time. Add approximately 10 to 15 minutes to bake time, if the surface area of the pan to be used is less than the surface area of the pan recommended, since smaller surface area will increase the depth of the ingredients. Reduce the bake time by 10 or 15 minutes if the surface area is greater, since greater surface area will decrease the depth of the ingredients. Adjust baking temperature only if using a glass baking dish. Reduce the oven temperature by approximately 25 F. The size of a baking pan does not impact oven temperature. Test the meatloaf five minutes before anticipated cook time elapses, as cooking times depend on the appliance used as well. All ovens tend to cook differently. Cut the meatloaf to see if the inside is still pink. Use a meat thermometer to detect temperature. When a meatloaf is ready, the inside will no longer be pink, and the meat will be at least 160 F.
Do not adjust the cooking time or temperature if you halve or double the recipe and use a pan that is half or double the size, respectively.